The gateway to thw WPA- era stone Scott Park Police Station. It incorporates the police motto into steel gates attached to 8 foot stone pillars. 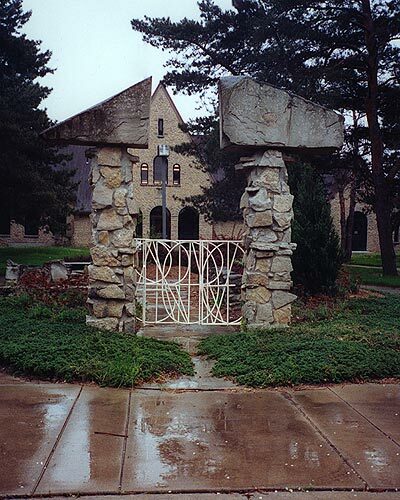 These gates open to a small seating area of limestone boulders and evergreen paintings. The words "" Serve and Protect"" are abstracted and incorporated into the gate design. : Carl Floyd, “Serve and Protect,” Ohio Outdoor Sculpture Inventory, accessed April 18, 2019, http://oosi.sculpturecenter.org/items/show/1082.